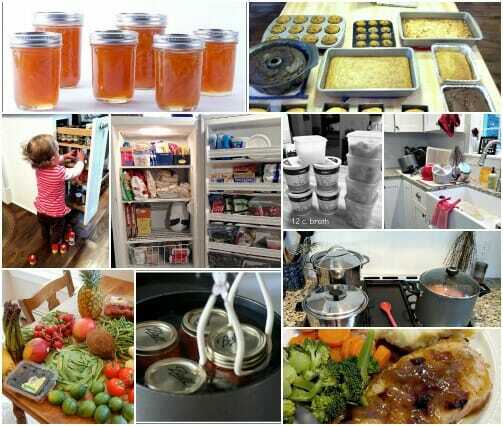 Some of my favorite ways to save time, money, energy, stress, and calories are by keeping my pantry and freezer stocked, planning my meals each week, canning my own produce, and baking in bulk. 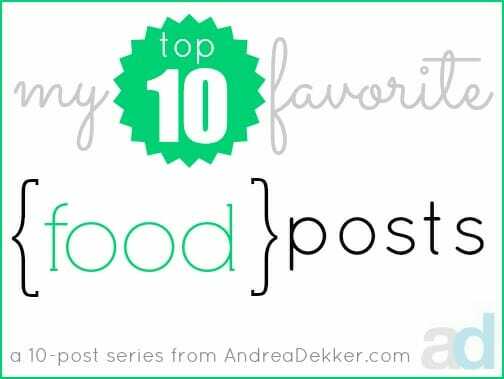 I’ve already shared my Top 10 Favorite Recipe Posts, and today I’m sharing 10 more of my favorite food-related posts. Here are my Top 10 Favorite Food posts — in no particular order. Although I wrote this post over 3 years ago at the last minute when I couldn’t think of anything else to post, it’s still one of the MOST popular posts on my blog week after week. It’s been shared on facebook and pinned on Pinterest THOUSANDS and THOUSANDS of times and I continue to get questions and comments on that post each week. Due to the popularity of that post, I actually ended up writing a follow-up “Freezer Cooking FAQ’s Post” a year later. Every couple of years (or whenever necessary) we defrost and re-organize our deep freezer. I always dread the process, but am always amazed at how quickly it ends up going. Plus, it’s amazing how much extra space we have when all the ice is gone and things are nicely organized again! I’ve grown up eating home-canned foods for my entire life. My mom and grandma both canned lots and lots of fruits, veggies, jams, sauces, etc — and boy do they taste good! So when Dave and I got married, I knew I wanted to continue canning — and over the past 3 years I have posted several canning and preserving posts here on my blog. This particular post is great for anyone getting started canning for the first time or gearing up for another round of canning starting this Spring. Here’s a link to all my canning posts. Here’s a link to a really great time-saving jam tip. I absolutely hate wasting food — especially produce. I also love finding really great deals at the grocery store. So I paired these two factors and came up with a really great way to save money AND salvage produce that’s past its prime. Believe it or not, although we eat almost all our meals at home, a normal week usually only requires me to be in the kitchen cooking a full meal 2 or 3 times. If you’d like to spend less time in the kitchen each week, read this post! When I bake, I BAKE! I usually make 4-6 different baked goods at one time — which is not always super easy to do with a toddler trying to “help”. In this post, I detail some of the things I do to make baking in bulk (with toddlers) a little less overwhelming! If I had to pick one freezer-cooking tip that saves me the most time and money it would be freezing pre-cooked ingredients. It’s faster and easier than freezing full meals, but it allows me to purchase groceries in bulk and have plenty of ready-to-cook-with ingredients in the freezer so 5:00 doesn’t seem so overwhelming! This is one of my more recent posts — and it goes into TONS of detail about how exactly I simplify meal-planning and avoid weekly or monthly meal-planning burnout. You all know I love giving clutter-free gifts — but my all-time favorite clutter-free gift is food (hands down). Although I don’t do it nearly as much as I used to, I really do love giving the gift of food to friends and family. Another bonus is that food gifts are usually good for any age, any gender, and any time of the year! Although I have NOTHING against cooking with a recipe, I know for a fact that my own cooking abilities have gotten a lot stronger since I started cooking without a recipe. I’m more adventuresome, more willing to try new things, and less likely to make the same foods over and over again — plus I enjoy cooking so much more! Which food posts are your favorites?